Dolores A. Stark, 76, of Montoursville, passed away Sunday, September 2, 2018, at AristaCare. She was born Oct. 7, 1941, in Rochester, N.Y., a daughter of the late John and Dorothy Clapper Anstadt. Dolores worked for the former C.A. Reed Co. and retired from Primus Technologies. 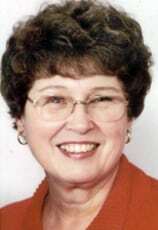 Dolores was a member of T.O.P.S, enjoyed her family and was a graduate of Montoursville High School, class of 1959. She was predeceased by her parents and a sister, Juanita John. Dolores is survived by her husband of 58 years, H. Eugene Stark; her son, Rick L. (Mary) Stark, of Montoursville; daughters, Brenda S. (Craig) Lewis, of Montoursville, Lori L. (Jeff) Williams, of Mohrsville, Karen R. (Brad) Parsons, of Williamsport; sisters, Lolly Mahoney, of Montoursville, Mary Jane (George) Hromnak, of State College; six grandchildren; and eleven great-grandchildren. A Celebration of Life will be held from 11 a.m. to 2 p.m. Saturday, Sept. 8, 2018, at Plunketts Creek Township Fire Hall, Barbours, Pa.